As some of you already know, I have decided to resume what I was writing for Vogue and Point de Vue some years ago, but this time as a blog. I would like it to be like a morning phone call to my best friend, a very personal and subjective view of Paris life for all of you who are curious of what's going on in France. I now have readers on five continents, from the Philippines to Tasmania, Perth and Sydney. From Mexico to California, New York, Washington and Canada. Morocco, Egypt and most European countries. Thank you ! We were eight members of the Gramont family to make the trip on the new four hour TGV to Bayonne, in the Pyrénées Atlantiques. Our ancestors Roger, Jean, Antoine I, were mayors and captains Antoine II, III and IV were governors of the town from the 16 th to the 18 th century. 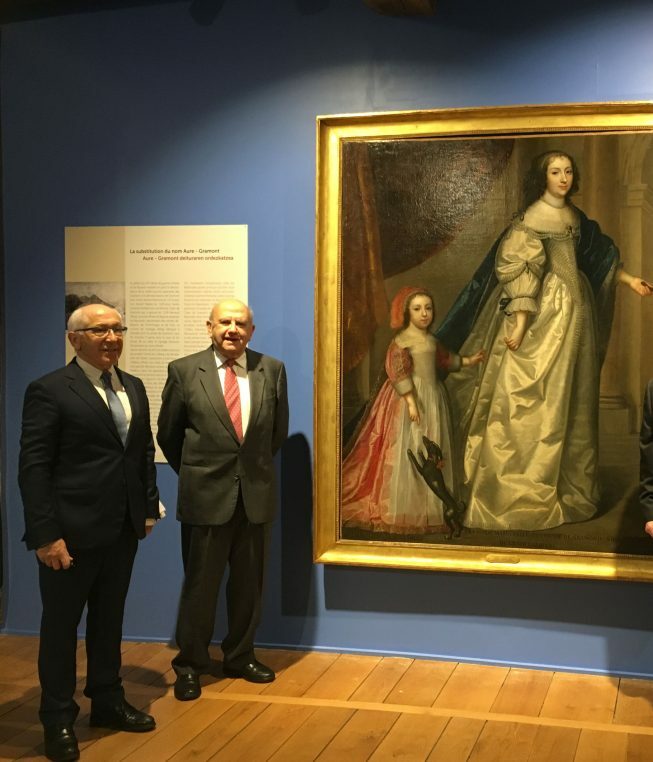 The occasion was the inauguration of an exhibition at Musée Basque by the mayor Jean-René Etchegaray and the head curator Olivier Ribeton : « Air de famille, children in the Gramont collection » shows fifty paintings and photographs made as early as 1570 and until 1928. It is part of the collection given to the city by Antoine XIII, whose grandson, Antoine XV, had flown in from Houston to be there. He is 10 years old and it was particularly touching to see him in this exhibition. 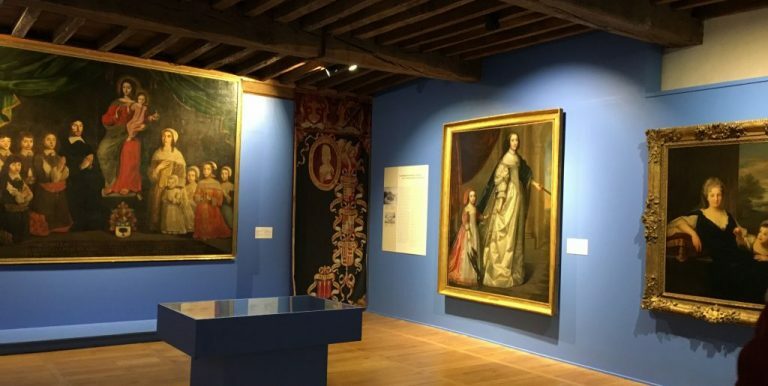 As we entered the first room, with the large portrait of Corisande, comtesse de Guiche, painted in the Spanish style by Juan Pantoja de la Cruz, with two magnificent Bon Boullogne portraits of Antoine V with his sons and his wife with daughter, we knew that the show was a success. The « royal » blue background to the paintings was a nice contrast to the following red and green rooms. Attr. to Juan Pantoja de la Cruz, Diane d’Andoins, dite Corisande, Countess de Guiche, with her daughter Catherine at 5, both dressed in Spanish style. She will become Henri IV’s lover and had a key role in his reign. 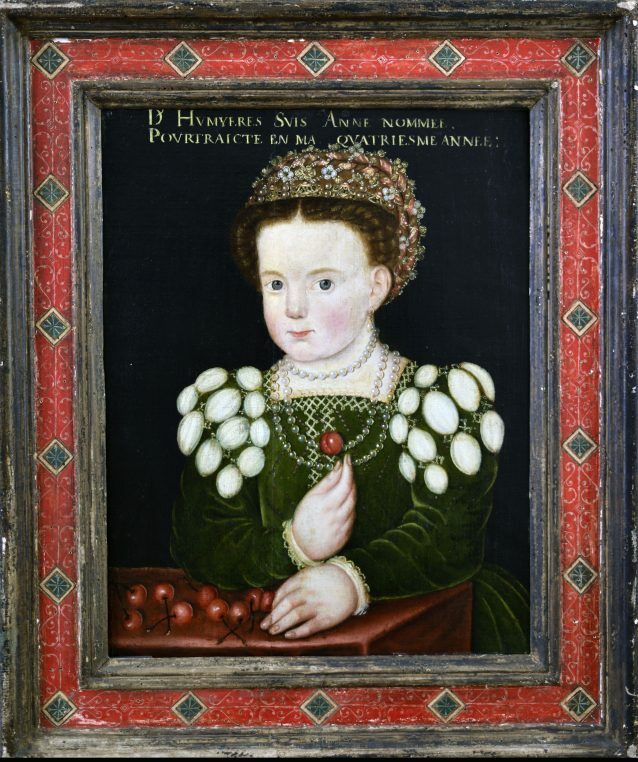 The ancient tradition of children’s portraits was to establish the legitimity and the power of the child in the lineage. 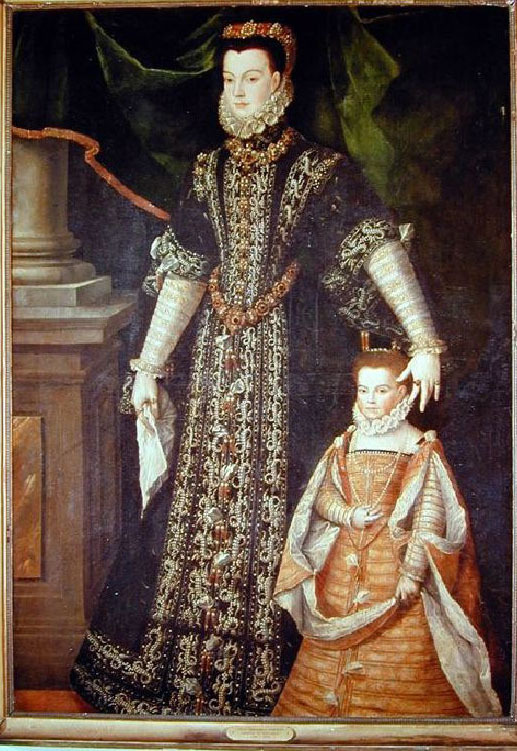 Catherine de Medicis used to have her children painted by François Clouet. 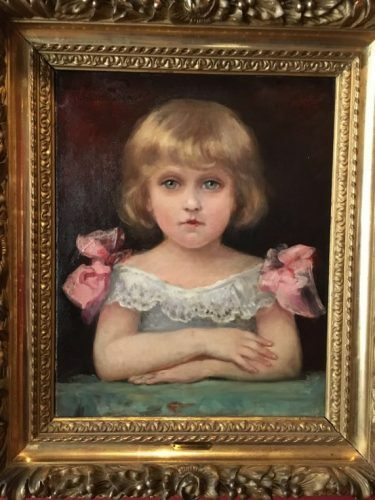 One of the prettiest paintings here was commissioned by their preceptor and is done by his atelier, “Anne d’Humières at 4”. She is holding cherries, a sign of fertility. Most portraits were saved by Antoine VII’s third wife, a commoner, after the family château was burnt in 1793. Bidache, as it is called, is located in the charming eponymous town twenty minutes east of Bayonne and its Renaissance ruins can be visited. It is quite majestuous, surrounded by la Bidouze river and l’Adour. This is where Mazarin, stayed when he came to negotiate the Treaty of the Pyrénées with the Kingdom of Spain in 1659. Another interesting painting is a very large ex-voto lent by the church of Asté, representing Bernard d’Aspe and his wife Marie de Gramont with their nine children in the XVII th century. The 19 th century is particularly fertile for children’s portraits. 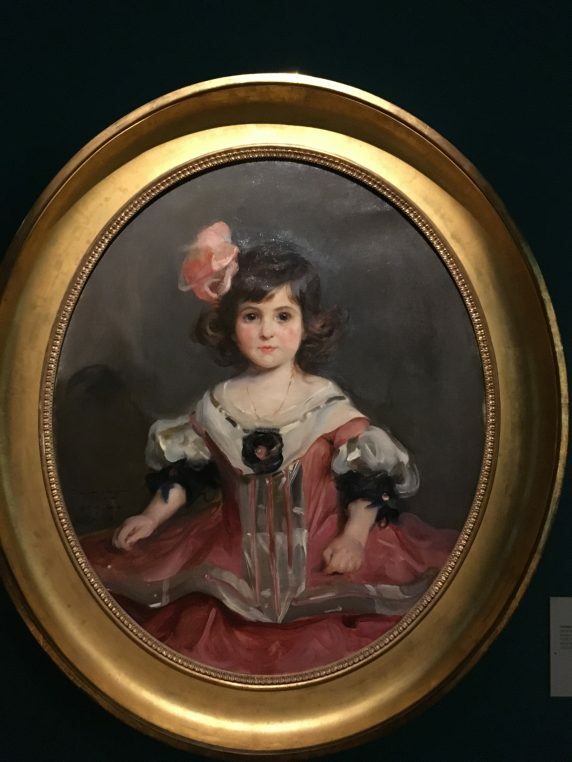 Following Jean-Jacques Rousseau’s principles, education becomes important and the paintings by Carolus Duran, Philip de Laszlo, Fernand Knopff, Paul César Helleu and Jacques Emile Blanche are a festival of dresses and costumes in the last room of the show. They are also a good description of society. 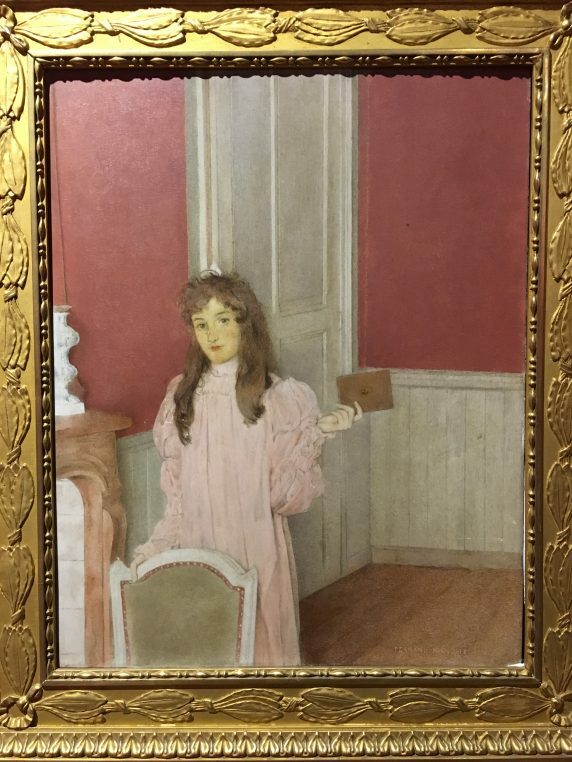 A room dedicated to the dandy Alfred d’Orsay whose sister Ida married Antoine IX, is particularly pretty with pastels of the boy at 7. And photographs of diplomat Antoine X’s children by Angerer, dating from 1860, tell us a lot about costumes of the period. Olivier Ribeton spent close to forty years studying the Gramont paintings. 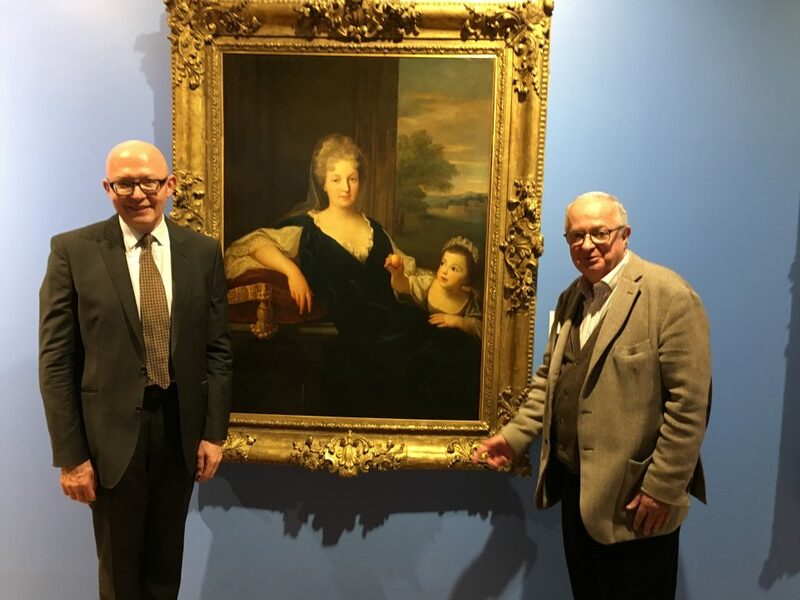 He met for long hours at château de Vallière with Antoine XIII in the 1970’s, when he was a student, and was a key actor in the bequeathing of this collection to the city of Bayonne. He has managed to create a very varied show, with a vision of society and a historical perspective given by Professor Eric Mension Rigau, who discovered in the library of Bidache, the manuscript of Alfred de Gramont’s memoirs in the 1900’s. His book, “L’Ami du prince” published by Fayard, was a huge success. He was also helped in the 20 th century by the fact that Philip de Laszlo had a studio in Duc de Guiche’s (the same who was Marcel Proust’s friend) house on avenue Georges Mandel. Thus all the intimate paintings of the children. Winnaretta Singer, future Princesse Edmond de Polignac, also a friend of the family with a house one block away on avenue Georges Mandel, painted Claude, Alfred de Gramont’s daughter. If you are in the Basque country for Christmas dont’ miss this happy show. Otherwise it is on until May 20 th at Musée Basque et d’Histoire de la Ville de Bayonne. To make your stay even nicer, I will share my addresses with you. Hôtel des Basses Pyrénées was friendly and perfect for the night and Auberge du Cheval Blanc, ideal for a gourmet lunch… We had dinner with an excellent palombe at Goxoki, a two minute walk from the museum. 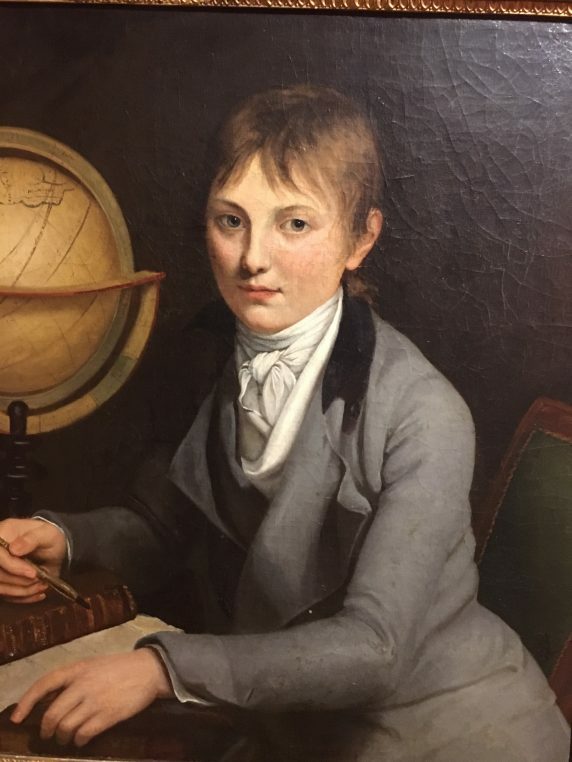 There is a catalog of the show at the museum’s library and If you want to learn more about the paintings, you can have a look at collectiongramont.fr, a website devised by Société des Amis de la Collection Gramont, with 150 portraits. It is working on the 3D recreation of the castle of Bidache and you can joining the effort for €30! 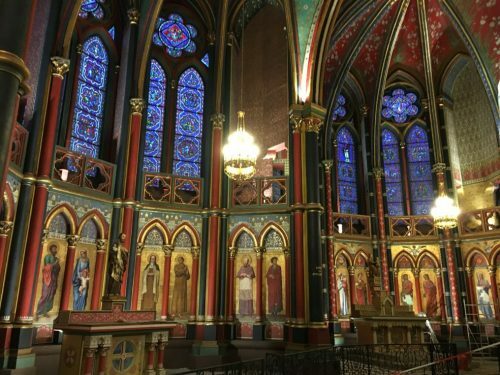 You can also indulge in chocolates, the specialty of Bayonne, imported by Spanish Jews who were fleeing the Inquisition in 1492, at Pariès and Cazenave and visit the cathedral which is entirely restored with its beautiful 19 th century paintings. The old center is small and you will discover Basque linen and espadrilles… And make sure to enter the Galeries Lafayette to see its listed 1920 decor. Bayonne is the less publicized town of the Pyrénées and has a lot to offer on top of Biarritz and Saint Jean de Luz. It is twined with Bayonne New Jersey of course! 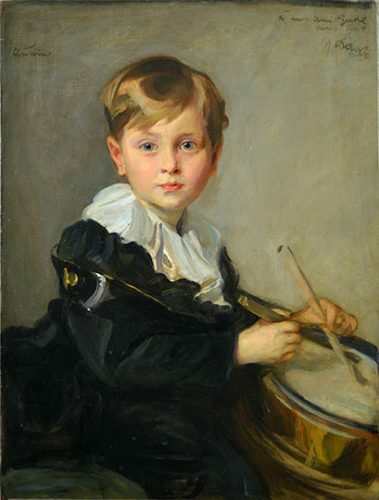 La Maison Baylaucq au château de Pau accueille jusqu’au 21 mai une exposition de portraits d’enfants issus de la collection Gramont. Une exposition qui reflète les grandes heures des Gramont, illustre famille pyrénéenne qui a gouverné le Béarn et la ville de Bayonne au 17e siècle. C'est une page importante de l'histoire pyrénéenne qui est mise en lumière dans cette exposition "Un air de famille". Les seigneurs Gramont, originaires de Navarre, ont gouverné du 16e au 20e siècle le Béarnais et la ville de Bayonne. Une famille qui a "donné" au pays : maréchal de France, cardinal, archevêque, ou encore ministre des affaires étrangères. La collection Gramont comprend 186 œuvres dont de nombreux portraits mais aussi des sculptures ou divers objets, certains réalisé par Alfred d’Orsay. Les œuvres ont été données, par le duc de Gramont, 13e du nom à la ville de Bayonne qui les a transférées au Musée national du château de Pau en 1991. 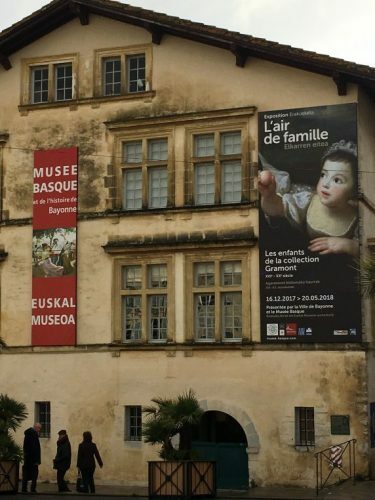 Olivier Ribeton, conservateur du musée du Pays Basque explique le choix d'exposer ces portraits d'enfants " Tous ces enfants de la famille Gramont, je pensais qu'ils avaient leur imaginaire à eux. C'était donc une façon de reconstituer l'histoire d'une famille, sa saga puisque c'est quand même une des plus vieilles familles des Pyrénées qui subiste encore". Séméac (65) et Bidache. Au XVIIe, à l’époque d’Henri-IV, ils ont été nommés gouverneurs du Béarn, comprenant le château de Pau et la ville de Bayonne, et sont restés présents dans les basses Pyrénées jusqu’aux temps modernes. Ils ont fait partie de la haute bourgeoisie parisienne où ils achetèrent l’hôtel De Gramont, devenu le Ritz. La Révolution n’épargna pas les De Gramont. Une duchesse, Beatrix de Choiseul, fut guillotinée en 1794.